These are the places to park when you visit the MATCH. Like most of Midtown, you will have to pay to park, but prices are reasonable. 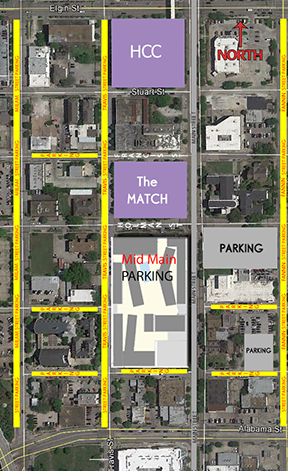 Close to the MATCH is the Mid-Main Garage directly to the south across Holman. This garage is accessible through Travis Street every weekday after 5:30 PM till 2:30 AM, on Saturday between 10 AM till 2:30 AM, and Sunday between 10 AM to 11 PM. There will be either be a parking attendant or a pay station where patrons can pay to park. Parking can range between $5 to $10. Cash only. Please note that Travis St. is a one way street traveling north. Mid-Main has two surface lots. One lot is located at the southeastern corner of Main and Holman, directly to the south of Trinity Church. This lot is available all day on weekdays and Saturday, and after 2 PM on Sunday. The other lot can be found at the southeastern corner of Fannin and Winbern. This lot is open to the public. Both of these lots have their own pay station where patrons can pay to park. Parking can range between $3 to $7, depending on the hour of the day. Cash only. There is also street parking available nearby (marked in yellow on map). Some of this is free and some is metered. Please be observant of all parking signage when choosing to park on the street.